This capolavoro (masterpiece) had long been on my wish list of Things to See in Italy, but mostly just to check it off the list; to say I had seen it. But standing in front of this infamous piece recently was incredibly moving, and thanks to an expert guide and a fantastic book, I learned details about the mural which I had never heard before. Below are just a handful. #1. The Last Supper in Italian literally translates as L’Ultima Cena, but da Vinci’s work is more commonly known as Il Cenacolo in its hometown of Milan. #2. It’s technically not a fresco, even though it’s often referred to as one. Da Vinci was neither skilled in nor suited to the technique of fresco, which involved applying pigment to wet plaster and then left to dry, and required the artist to work fairly quickly. #3. Because of this unconventional technique, The Last Supper began deteriorating soon after it was completed around 1498. Through centuries of restoration, today what you see is far from what da Vinci created, but it’s the closest it’s ever been. #4. You won’t find this famous piece hanging in a museum, because it was commissioned to decorate the refectory walls of the church of Santa Maria delle Grazie, where Dominican friars ate their daily bread. Common in many refectories but missing in Santa Maria’s was a last supper scene. In 1495, wanting to ingratiate himself with the friars, Milan’s duke Ludovico Sforza commissioned da Vinci, an artist already in his court, to paint a last supper on the refectory wall. #5. The Last Supper is not the only mural in the church’s former refectory. 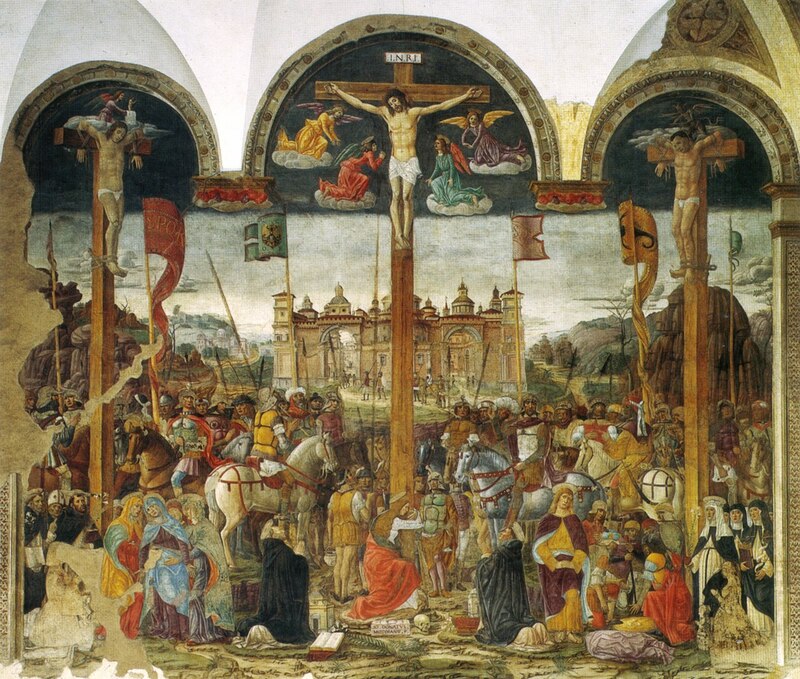 It faces another mural (this one really is a fresco): The Crucifixion by Giovanni Donato da Montorfano, circa 1495. It’s magnificent as well. #6. The church of Santa Maria delle Grazie (Holy Mary of Grace) is a UNESCO World Heritage site, named in 1980 and one of Italy’s 47 sites on the list. #7. This peaceful red brick church, with a dome designed by Donato Bramante (one of the main architects of Saint Peter’s in Rome), is a World War II bombing survivor. Fearing for the safety of The Last Supper, precautions were taken with scaffolding and sandbags to help protect the church wall in the event of an attack. 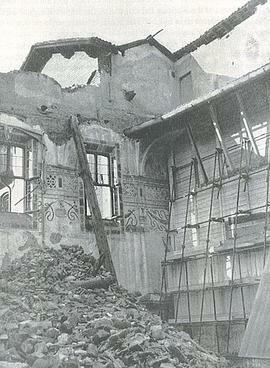 On August 15, 1943, Santa Maria delle Grazie sustained heavy damage when a bomb from Allied forces landed nearby. Miraculously, the wall with da Vinci’s priceless work remained standing (it’s the wall with the scaffolding pictured below). #8. The church is a veteran of other wars, too. In 1796, when Napolean’s troops invaded Milan, one of his generals chose Santa Maria delle Grazie’s refectory as a stable. #9. What happened to Jesus’ feet? You remember that the refectory was the dining room for the Dominican friars, and behind the wall upon which The Last Supper was painted was the kitchen. In 1652, possibly wanting a more direct route between the two rooms, a section of the wall was knocked out and replaced with a door. The portion depicting Jesus’ feet was lost. #10. Thankfully, because of a twin painting, today we can see what da Vinci’s original may have looked like (including Jesus’ feet). Below is thought to be the most accurate reproduction of da Vinci’s mural, painted in 1520 by da Vinci’s former apprentice Giovanni Pietro Rizzoli (also known as Giampietrino). Interested in seeing this piece for yourself? It’s housed at the Royal Academy of Arts in London. It’s also possible that da Vinci depicted church architect Donato Bramante as the apostle Bartholomew (furthest apostle on the left), and may have even used himself as the model for St. James the Lesser (next to Bartholomew). #12. Nice, neat knots at the corners of the tablecloth went unnoticed by me, even when I was standing right in front of this awe-inspiring piece, actively scanning it for details and symbols. Thankfully our guide, who was a wealth of art history knowledge, called this to our attention. Da Vinci had an affinity for knots and il vincolo (close enough to vinci) means knot in Italian. Knots appear in several of da Vinci’s works, and may have been how he signed his pieces. “Tell me if anything was ever done,” Leonardo used to doodle in the pages of his notebooks…. The Last Supper was the triumphant discharge of the debt that his genius owed to history. Over the course of three years he managed — almost for the only time in his life — to harness and concentrate his relentless energies and restless obsessions. The result was 450 square feet of pigment and plaster, and a work of art utterly unlike anything ever seen before — and something unquestionably superior to the efforts of even the greatest masters of the previous century. Resources: Walks of Italy, Bibliotecha, Wikipedia, Mental Floss, Sacred Destinations, Leonardo and The Last Supper by Ross King (highly recommended). You may also enjoy Of Masterpieces and Mysticism, my essay on standing in the presence of The Last Supper. This post first appeared on Prayers and Piazzas. Tags: Art, Art History, Italy, Leonardo da Vinci, Milan, The Last Supper, Things you may not know about The Last Supper, Travel. Bookmark the permalink. The knots are very interesting. Thanks for the up-close and personal perspective. Thank you for stopping by, so glad you enjoyed the piece! It was nice to read, I just left Milan on Wednesday night and am sitting at home in NZ a little bit in shock at my changed situation. Its always hard making the mental adjustment. Your post brought to mind San Pietro in Vincoli in Rome where the Michelangelo sculpture of Moses sits and how in this instance Vincoli means chains so I just did a google translate and it can also mean constraints.Italian is an amazing language, words often referring to a range of meanings, which as we know makes it crazy hard to learn! Bentornata, Andrea. I know the re-entry from Italy can be difficult! I hope you had a wonderful stay and looking forward to details you might share on your blog. Great addition for the meaning of vincoli — I also noticed it had several translations. I’m anxious to hear how your Italian went this time. Un abbraccio! This is fascinating! I had no idea that The Last Supper was a fresco, even if not technically so. I thought it was a framed painting hanging somewhere. You can tell I’m not an art historian either lol. I enjoyed reading your facts and hope I get to see it someday. I’m surprised at the huge difference between the twin painting and the way the actual painting looks now though. Oh, thank you for this lovely reminder of how much I always loved learning about art history (for the first time in college) and later teaching it. I’d never seen the photo from 1943… breathtaking. Can you imagine if they hadn’t taken any precautions at all?